Research, UI/UX design, visual design. I am the primary User Experience Designer and Researcher on this project, starting from research and discovery, to prototyping, testing and the current design. Pineapple is an app that helps you find and connect with local comedy shows in your area. This project is a continual work in progress that was started during my User Experience Design class at General Assembly. Throughout the class we went through each step of the design process to develop an app from scratch, as outlined below. The first step in this project was identifying a problem–what is something that could use improving, that could benefit from an enhanced, more useful user experience? With the wealth of comedy shows available now and a very active indie comedy scene, it can be difficult and overwhelming for fans to find and keep track of shows they might be interested in. 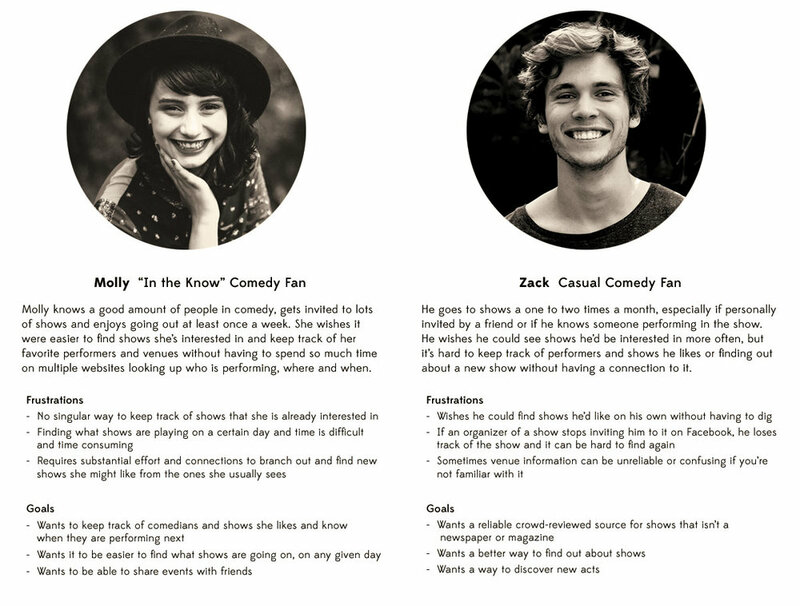 Develop an app that aggregates and lists all comedy shows happening on a certain day and allows users to browse and search according to their interests, location and price. Ideally, this app would allow users to Discover, Track and Organize all the shows they are interested in. For the first step of the research process, I set out to interview fans of improv–casual fans, super fans and fans who are also performers. Since this problem was so close to heart, I also considered my own frustrations and pain points. For the MVP, I focused on the Fans first. Following my interviews, I created an affinity diagram of my users' interests, feelings, pain points, and responses to the subject of finding shows. Now that I had my personas defined and a clear idea of the user, I set out to canvas the competitive landscape and see if there were any options already available. With this analysis, I came to the conclusion that currently, there is no direct competitor in the market for comedy show listings. New York Improv Teams is the closest competitor, but it is only a website focused on local improv. Facebook Events are the method of choice for promoting shows. Additioanlly, each major comedy venue in the city has it’s own website and calendar. Indirect competitors in other markets include BandsInTown and SongKick, which provide a good beginning foundation for this app. Given the clear image of the user and the competitive landscape, focus shifted to developing the MVP for this app. I already knew I wanted to focus on the Fans first, before expanding into Performers, since Fans are the ones who seek out shows most. Having this in mind, I created the following Feature Map. - More specific sorting options, indicators forshows that feature women, LGBTQ, diverse cast, etc. Finally, I headed into wireframing and rapid prototyping of the app. 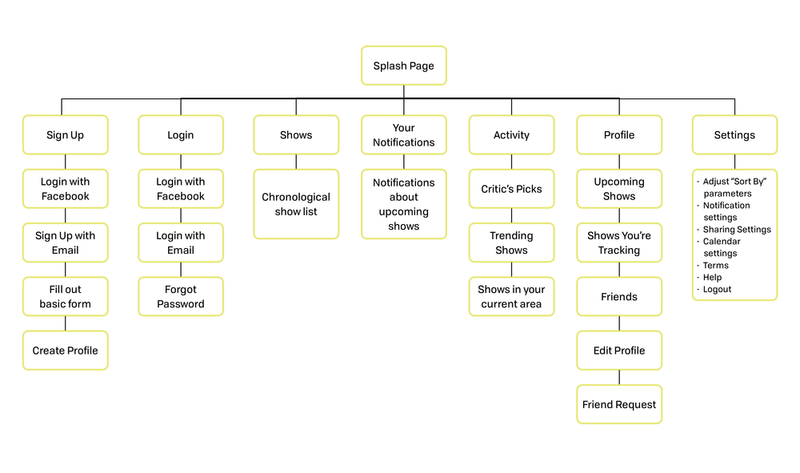 I created a user flow and a site map from which to work from. Then, rough sketching with index cards and InVision. Following the initial rapid prototype and testing, I created higher fidelity wireframes and revised some design elements after user testing. Following the rapid-prototype, I built out the wireframes in mid-fidelity in Sketch and uploaded to Invision. Below is a breakdown of the wireframe screens. For this round of usability testing I created a User Task to find an improv show on a weeknight that starts after 6PM and costs $5 or less. With these new wireframes, I continued to do user testing and receive feedback. What is the “Activity” section? How is it different from “Your Notifications”? What are the prices for shows? What can the search bar search for? When it’s visible over the profile window what does it search for? Should the “Sort By” and Search bar be combined? How do you Add a Friend? What does the Friends section show? How are Shows and Tracking Different? My next steps are to continue building out the app, partnering with a developer and doing more usability testing, as well as interviewing comedians and performers to build out the Performers section of the app. The main takeaway I learned while working on this project is that the comedy world is ever-changing, with venues, shows, improv teams, and what's popular. In turn, this translates into how shows are being produced and promoted. Not everyone is searching for the same things when they are looking for a show to attend. Additionally, teams disband and often there are one-off shows that are planned last minute. These are all factors we have to keep in mind when developing this platform. Below is the current design of the app.